Duco focus on a wide variety of functional glasses from night vision glasses, prescription glasses, sports cycling glasses, anti blue light computer glasses to UV400 protection polarized sunglasses. We endeavor to provide quality products at reasonable prices which provide value to our customers. Eye strain, visual stress and dry eyes can be caused by extended periods of digital screen viewing and office lighting. 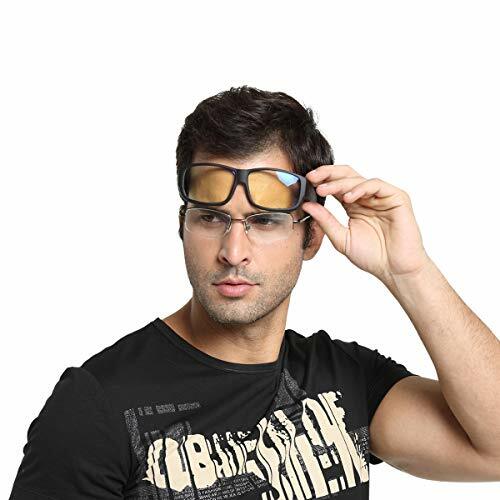 DUCO amber tint lens make these glasses perfect for computer and video gaming as it increases gaming precision and graphics, while the wide format lenses create a panoramic viewing field for high resolution viewing. The anti-glare lens blue coating is specifically engineered to filter out the harsh, high-energy part of the spectrum, reduce digital eye strain and enhance viewing detail so you can stay focused and perform more efficiently throughout the day. If your spectacles frame width is less than 138mm, height is less than 39mm, please buy M.
If your spectacles frame width is more than 138mm and less than 145mm, height is less than 40mm, please buy L.
If your spectacles frame width is more than 138mm and less than 145mm, height is more than 40mm and less than 45mm, please buy XL. Finally! Computer glasses can be worn over existing prescription glasses with Fashion appeal and designer features. Please take a minute to check detail page. The frame is made of TR90, it is extreme flexibility, durability and light weight make it the perfect material for performance eyewear. It can be bent to 90 degrees without broken and can float over water.So it is much worth your money than other's Polycarbonate Frame which may be half of DUCO's price. 30 Day Money Back Guarantee. Lifetime Breakage Warranty. It must worth your money, return and refund is applicable for any reason. Just have a try.